Carl notes a number of similarities between our workbenches and recent projects. All he needs now is a Drake 2-B! I am very pleased that you finally got it working with the help of brothers from the fraternity. Having listened to your latest Podcast I think that must be your alter ego! 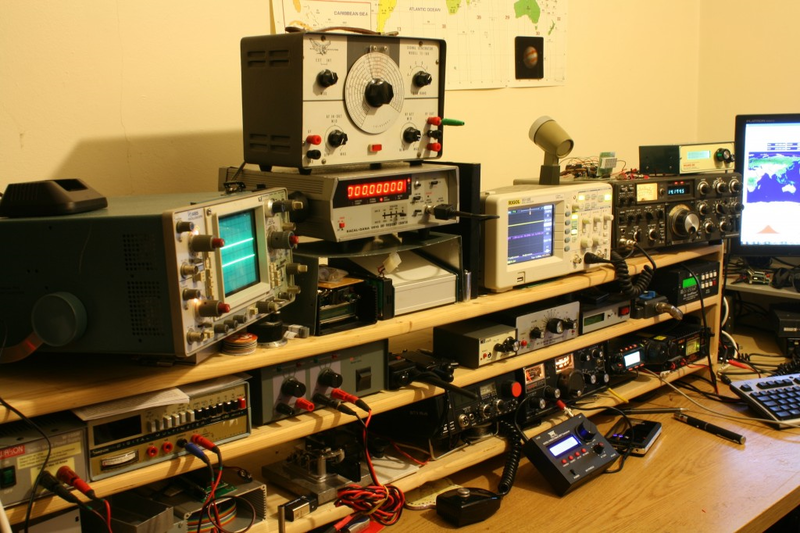 I have A Tek 465, Rigol 100MHz DS1102E and have built 2 Bitx, one for 20m and the other for right bands- using a DDS VFO (3 if you include the 80m version by Steve Drury G6ALU - look up MKARS80) ...I also have 2 copies of SSD! My website is here: www.iqrp.net where you can see both scopes in my shack and images of my Bitx and my Hans Summers WSPR beacon! I have just returned from my local radio club social meeting (the Radio Society of Harrow) and took great pleasure in listening to Soldersmoke 158 whilst driving there ... half on the way there and the other half on the way back. BITX 20/40 Build Update #5: It is ALIVE! BITX 2040 Build Update #3 Receiver Sounds Great!